CONGRATULATIONS, BRILEE KNIGHT from Highland Elementary, you are our 2017-18 T-shirt Design Contest Winner! Kristi Valiant, Illustrator of Goodbye Cancer Garden looked through some great submissions and chose this design for its "clear, unique, well-drawn design with the right amount of detail." Brilee's team will get FREE t-shirts this year. Click on "forms & resources" for t-shirt order forms or email indianabattleofthebooks@gmail.com for more information. Thank you, Imagination Ts for helping us make this possible! Be creative! 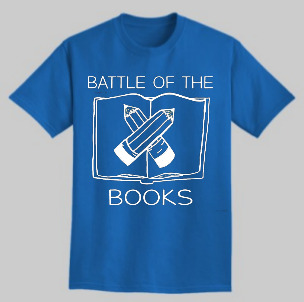 The actual design, the concept for each design, how the design elements (line, dominance, scale, space, shape, etc) work together to create a piece and what piece best speaks to the Battle of the Books event will all be considered when choosing a winner for the t-shirt design contest. T-shirt submissions may be submitted on-line or by mail. Separate from the image, please provide: student’s first & last name, grade, team name, and school/group name for each design submission. The winner of this contest will receive recognition at our Readers Celebration ceremony and on our website and their team will earn FREE t-shirts! All teams will have an opportunity to buy shirts with this design, customized with their team name on the back (shirts will be different colors).